Asus launched five motherboards based on the X470 chipset to accompany AMD’s newly launched 2nd-Gen Ryzen processors. Asus has an ATX model for each of its motherboard product lines: ROG, Strix, TUF, and Prime. The company also released one ITX motherboard, which falls into the Strix series. The star of Asus’ X470 boards is the latest iteration of the long-running Crosshair name, ROG Crosshair VII Hero. When it comes to component support, the board features everything you’d expect, including four DDR4 DIMM slots, dual reinforced PCIe 3.0 x16 slots, dual PCIe 3.0 x4 M.2 slots (one with a heatsink), and six SATA 3.0 ports. On the networking front, the Crosshair has integrated 802.11ac WiFi and Bluetooth 4.2 (based on an Intel wireless controller) and gigabit Ethernet through a single RJ-45 jack. What differentiates the Crosshair VII from its predecessors, beyond its chipset, are some interesting new Asus-exclusive features. Like other ROG boards, the Crosshair VII supports Asus’ Aura lighting ecosystem and has both four-pin 12V RGB and three-pin digital RGB headers. Asus mentioned that Aura is now even compatible with the Philips Hue wireless home-lighting ecosystem. Details on this integration are scarce at the moment, but Asus said the latter can be controlled by the Aura app. Two other features new to the Crosshair, and also to the entire ROG motherboard line, are newly designed board silkscreen labels, which better highlight connectors, and what Asus calls Truvolt USB connectors. These USB ports are guaranteed to provide 5V so your port-powered devices, such as portable hard drives, won’t be at risk. Of course, other ROG stalwart features, such as an advanced integrated audio solution with a dedicated ESS Technologies DAC chip, are present. Because the ROG Crosshair is expected to be used with the highest-end Ryzen processors, which don’t have integrated graphics, the motherboard forgoes onboard video connectors. Slotting in below the flagship Crosshair are the enthusiast gamer’s Strix X470-F Gaming and the upper-midrange Prime X470-Pro. These two boards differ mainly in their aesthetics. The all-black Strix board comes with RGB-lit heatsink covers and an integrated rear I/O shield. The Prime follows Asus’ classic black-and-white color scheme and features less integrated RGB lighting. Both motherboards still feature built-in RGB headers, however. When it comes to hardware, the Strix and Prime lose the Crosshair’s integrated wireless connectivity and have differently configured M.2 slots. Whereas the Crosshair has dual PCIe 3.0 x4 M.2 slots, the Strix’s and Prime’s second M.2 slot is only PCIe 3.0 x2. Between the Strix and the Prime, the Strix features a slightly upgraded integrated audio solution, but it isn’t as advanced as the Crosshair’s. Both of these boards have onboard HDMI and Displayport connectors for use with Ryzen processors that have integrated graphics. Rounding out Asus’ announcement are the TUF X470-Plus for mainstream computing and the Strix X470-I Gaming for ITX gaming systems. The TUF series motherboards are the most basic of Asus’ offerings. Rather than trading features for a lower price, they forgo features for guaranteed reliability. Like others in the TUF series, the TUF X470 features power regulation circuitry that won’t enable the best overclocks, but are hardened against electrical fault. Other areas of the board also feature extensive surge protection. The board features the same configuration of PCI-E and M.2 slots as the Strix and Prime boards. Although it’s the tiniest, the Strix X470-I Gaming isn’t considered by Asus to be a mainstream product like the TUF. The X470-I is still targeted at enthusiasts, so it packs advanced integrated audio, RGB lighting capabilities equivalent to the X470-F, and an integrated wireless solution equivalent to the Crosshair’s. Being smaller means it loses out on two DIMM slots, and all but one PCIe slot. The board has one PCIe 3.0 x4 M.2 slot on the front and a second on the back. Strangely and unfortunately, Asus stated that despite how many PCIe lanes should be available to this board, the rear M.2 slot shares its bandwidth with the main PCIE slot. Most of Asus’ new motherboards can already be found on Newegg. The Crosshair retails for $300, the X470-F Gaming for $215, the Prime for $185, and the TUF for $160. Electrolytic caps don't belong on TUF series boards. I don't care if they're Nichicon gold caps for the audio. If I wanted that I'd buy a board from one of the other series. The entire reason I bought my TUF board was for the 100% all solid-state caps (and the 5 year warranty). Looking forward to all the reviews! Let's just hope that there are no bugs this time, especially revolving around memory that the first generation suffered from. Which seems to indicate their standard TUF caps are being used (https://www.asus.com/Microsite/mb/Tuf/why-tuf.htm). "Designed exclusively for 8th generation Intel? Core™ processors to maximize connectivity and speed with Dual M.2, Gigabit LAN and on-board WiFi, USB 3.1 Gen2, and Intel? Optane™ Memory compatibility"
Its a bit disappointing, the Crosshair board has 5 PCI express slots whereas the other boards have six. And why can they not put the cmos battery in a better place? If I have 2 video cards I'll never be able to get to it. If they're water cooled, I need to take apart my whole loop if I need access to the battery. They look nice though, ASUS does make sharp looking components. ^^Note the whopping 27% improvement with a second Vega 56 or the barely better 38% improvement in SLI with two GTX 1080s. And that's a game that actually supports multiple GPUs well these days. Historically, good multiple GPU scaling for the money meant a 75% or higher improvement in frame rates. That number has been declining for years. personally i liked the old strix design, and was looking for the same this generation, not a fan of the new strix look on the motherboard. i liked the clean PCB design with the accent color but this gen they seem to be hitting hard on promoting their boards as their name rather than looks (the branding is everywhere and not subtle) maybe we will get the other designs later on after the release, i was rlly looking forward to those. 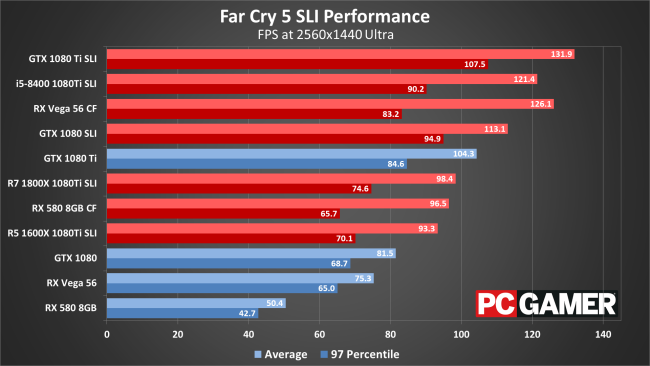 Case in point, the poor scaling of a second GPU in Far Cry 5 with either SLI or CrossFire: https://cdn.mos.cms.futurecdn.net/b8eRjFF6gbTXTZTzfgXD9A-650-80.png ^^Note the whopping 27% improvement with a second Vega 56 or the barely better 38% improvement in SLI with two GTX 1080s. Vega 56 gets about 75 FPS average, while Vega 56 CF gets 126 FPS, a 67% improvement. The minimum frame rates only show a 28% improvement, but that is likely due in part to the CPU limiting performance in those cases. Likewise, an RX 580 averages around 50 FPS, while RX 580 CF gets 96 FPS, a 91% improvement, and minimums show about a 54% improvement for that card. If you have a second matched GPU available, both CrossFire and SLI work, with CrossFire in particular putting up some impressive scaling results. And why can they not put the cmos battery in a better place? If I have 2 video cards I'll never be able to get to it. If they're water cooled, I need to take apart my whole loop if I need access to the battery. Would you even need to remove the battery though? If it's for resetting motherboard settings, I imagine that the board includes a button or jumper to perform the same task. And I really doubt that the battery would be likely to fail for a number of years, during which time anyone with liquid cooled graphics cards would probably need to tear their loop apart for maintenance more than once anyway. And of course, cards with standard air coolers should take only a matter of seconds to remove. Are we looking at the same graph? >_> Vega 56 gets about 75 FPS average, while Vega 56 CF gets 126 FPS, a 67% improvement. The minimum frame rates only show a 28% improvement, but that is likely due in part to the CPU limiting performance in those cases. Likewise, an RX 580 averages around 50 FPS, while RX 580 CF gets 96 FPS, a 91% improvement, and minimums show about a 54% improvement for that card. I'm looking at 97th percentile FPS which shows minimum performance over max/average. It's like the old horsepower vs. torque curve number comparisons: horsepower is important in upper RPM for high speed, but torque is important in low RPM to get launched. Both eventually cross in a power curve to find the balance. The PC Gamer tester (Jerred Walton, former Anandtech Editor) was using an i7 8700K paired with an MSI Z370 Gaming Pro Carbon AC with 16GB of DDR4-3200 CL14 G.SKILL memory, so I doubt the chipset was inhibiting any GPU performance. But that's neither here nor there. I had SLI 970s for two years and saw each new successive game decrease scalability. That is if they even supported SLI out of the gate. It's no big secret that multi-GPU support is a dying platform for PC gamers. I don't say this lightly as a 20-year PC building veteran being an early SLI adopter with a pair of Voodoo2's in 1999 and has had five SLI setups in that time!